Recently opened in Sicily, the region’s largest mall “Cen-tro Sicilia”, is characterized by more than 12,000 m² of translucent covering. This single level structure is an ex-cellent example of architectural functionality based on the principles of eco-sustainable design – the most important feature for a center situated in a region where the tem-perature easily reaches very high levels. The application of the skylights of huge size would have allowed for tre-mendous internal heat build-up resulting in extraordinary air conditioning costs. 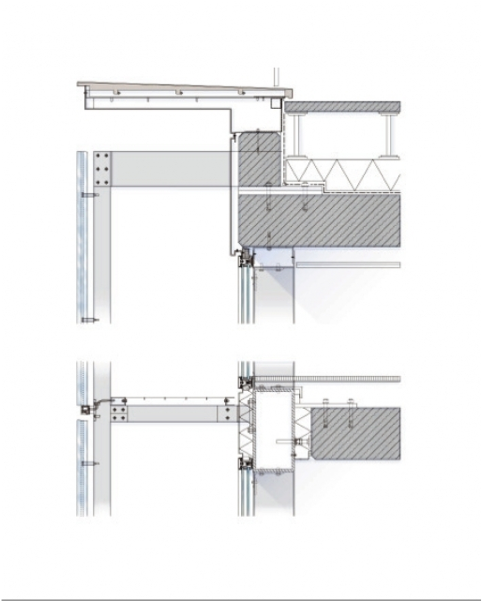 The use of the wide polycarbonate sheets with the exclusive IR filters has permitted to solve the problem of internal overheating, making Centro Sicilia unique project. The Polycarbonate IR sheets constitute covering of all common areas of the center permitting the passage of natural light and maintaining at the same time a comfortable internal atmosphere. Will transparent polymers kill glass? A silent revolution is taking place these days. Due to a number of reasons, the glass position as the one and only transparent filling for curtain walls is being threatened. Who is the new kid on the block? Well, it has been around for a while, but it has grown bigger now: transparent recyclable polymers, commonly called thermoplastics. The attack of the polymers has already started, in the way barbarians entered the Roman empire: as an alliance. If you need a good bullet resistant glass you will end up in a laminate called glass-clad polycarbonate. Beware: the higher the bullet resistance requirements, the less glass there will be in the laminate. If you are after a blast-resistant curtain wall, the options are heavy PVB laminated glass (1.52mm or more of polyvinyl butiral layers) or glass combined with an ionoplastic interlayer as SetryGlas, in widths of 2.28mm or more. If you want to have overhead glazing or horizontal glass with live loads, there you will find the plastic companions again. 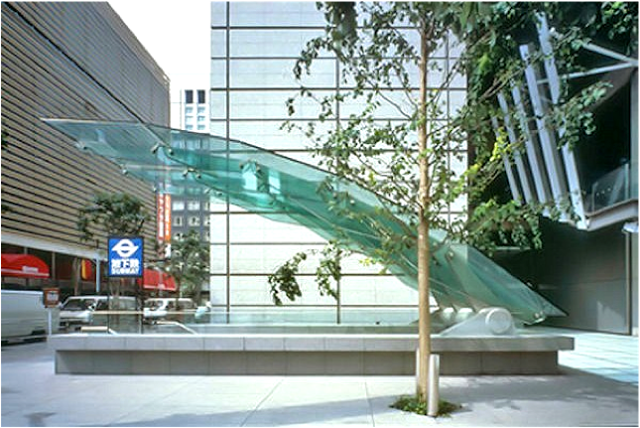 Structural glass is in fashion, and you may want to achieve all-glass, non metal-supported transparent structures. When you do that, most of the time it’s due to the help of polycarbonate sheets glued to the glass with transparent polyurethane interlayers. Tokyo International Forum, glass canopy details. PMMA was not required structurally but it was added as a safety measure against typhoons and earthquakes. This was the situation up to now. Glass is still in complete command if we want to clad a facade with a transparent, low U-value, durable and non combustible material. A curtain wall is still synonym for a glass curtain wall. But things are starting to change, and the big polymers suppliers have focused their attention onto the new frontier: to introduce Transparent Composite Facades (TCF) in lieu of Glass Curtain Walls (GCW). I have taken the TCF name from a PhD dissertation in the University of Michigan, submitted by Kyoung-Hee Kim in 2009, and advised by Professor Harry Giles. The title is Structural evaluation and life cycle assessment of a Transparent Composite Facade system. I have also got ideas for this post from a presentation at the last Glasstec conference in Sept 2010: New materials for transparent constructions, by Eckhardt and Stahl. Prism Cultural Centre in West Hollywood, California by PATTERN Architects. Translucent facade in resin-based composite polycarbonate. 3Form, an advanced material fabrication company specializing on resin-based composites, has collaborated on the facade solution. The contenders to take the place of glass in curtain walls are four thermoplastics: polycarbonate (PC), polymethylmethacrylate (PMMA or acrylic), polyethylene terephthalate (PET or nylon) and polypropylene (PP). PET and PP are still lagging behind in the race, mostly because of their low stiffness and low ultimate strength. PET and PP have a Young’s modulus 1/7 and 1/2 that of polycarbonate and acrylic, and their ultimate strenght is 1/3 that of polycarbonate and acrylic. 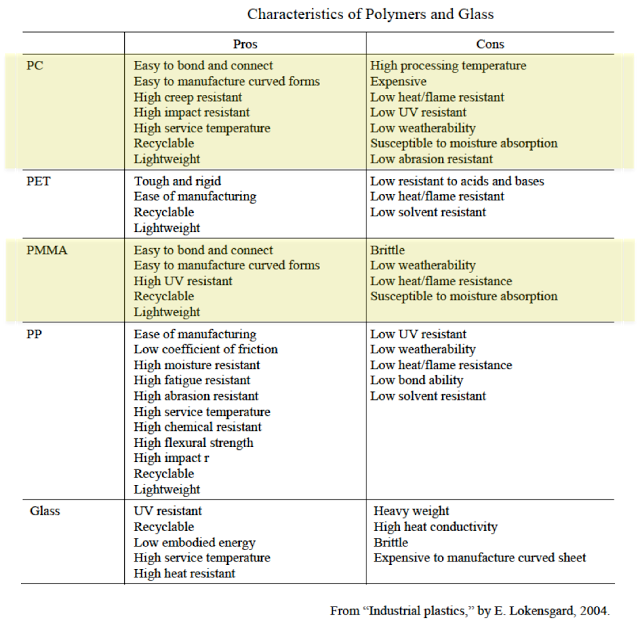 The main advantages of polycarbonate and acrylic, on the other hand, is that they are 20 times less brittle than glass and their ultimate streght can be two times higher than glass (see data on the table below). So, we will focus on polycarbonate and PMMA / acrylic from now on. Some may say these two materials have been around for too long to worry about them now. That is true, but doesn’t tell the whole story. Let’s call them by their best-known brands: polycarbonate is better known as Lexan, Makrolon or Danpalon. PMMA / acrylic is sold under the brands Plexiglas, Lucite or Perspex. Polycarbonate, either in solid or in multilayered sheets, has found a safe place in architecture as a translucent wall cladding, not transparent. A great example is the Laban Dance Centre in Southern London, a proyect by the Swiss architects Herzog & de Meuron with PC sheets supplied by Rodeca in Germany. The cladding on the Laban Centre has four layers with a U-value of 1.45 W/m2°K, better than a low-e double glass unit. But present multiwall polycarbonate sheets, only 60mm thick, have already reduced the U-value to 0.85W/m2ºK, in the range of a triple glass with argon and low-e coatings. Polycarbonate can also reduce reliance on secondary solar control; the panels used at the Laban Centre feature dimpled inner skins that diffuse the light. Concerns over the durability and UV resistance of polycarbonate have now been reduced thanks to new film protection technology. Manufacturers now guarantee that the polycarbonate will lose no more than 1% of its transparency over the first 10 years. All this is fine, but this is still a translucent wall, a cladding material for gyms, dance centres, swimming pools or industrial buildings. A composite construction consisting of a polymer double skin with an inner composite core, configured to provide a stiffer, safer, energy efficient and lightweight alterative to a glass façade system. This new ‘glazing’ system has spurred studies that evaluate the material performance of polymer and composites as a cladding material. The polymer skin has a sustainable characteristic due to its recyclability, which can help to reduce the environmental impact associated with raw material depletion and disposal. Let’s use an existing example to visualize the new TCF coming. Kalwall is a well known US translucent facade and skylight system, whose filling material by the way is a thermo-set polymer reinforced with fiberglass, with modified properties regarding UV-resistance and reaction to fire. The basic panel comes in standard dimensions and is installed as a very simple curtain wall unit sistem. City & Islington College, London. Van Heyningen and Haward architects. Kalwall and glass facade. The best version of Kalwall, pushed by Stoakes (the UK distributor) to comply with EU directives, has really low U-values by using thermally broken profiles combined with aerogel insulation. Even without aerogels you can have a 100mm panel, filled with polycarbonate fibres, with a U-value of 0.83W/m2ºK and a solar factor of 0.15. But, alas, it’s still translucent. Now, imagine you replace the fiberglass reinforced thermoset at both sides of the panel with a high resistant solid policarbonate sheet, and add some intermediate transparent sheets to improve its U-value and acoustic performance. The outcome would be something similar to Kalwall – with the same Japanese paper-like rectangular pattern – but wholly transparent, no glass required whatsoever. Stop imagining, this concept is already being developed somewhere in Europe. If we move to PMMA / acrylic, a similar story is being written these days. The material can be easily molded to achieve fuzzy shapes at a cost which is only a fraction of glass. In solid state, acrylic sheets can be cut and mechanized using laser cut CNC machines to provide extrusion-like profiles. A great example is the facade of the Reiss HQ building in London by Squire and Partners architects, with a machined PMMA external skin, and lit with an LED system at the bottom of each floor level. Reiss London. Double skin facade with acrylic and glass. Reiss London. Acrylic milling process and finished facade panel. Evonik Röhm, the company that owns the Plexiglas brand, was founded by Mr Röhm, the inventor of PMMA in 1933. After almost 40 years, the Olympic stadium in Munich by Frei Otto is still a forward-looking piece of architecture. The complex grid of steel cables was clad with a solid, tinted Plexiglas sheet to provide shelter against the summer sun rays. Need versatility? The monolithic thickness of PMMA is 200mm in a dimension of 3 x 8m – larger than glass, and you can even weld acrylic with hidden joints for bigger units. 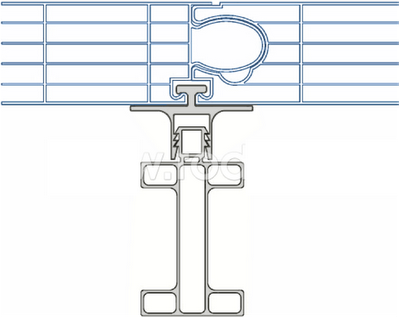 In the extrusion process you can obtain 25mm thickness, a width of 2m and no limit with length. Olympic Stadium, Munich 1972. Frei Otto and Günther Behnish. Curving a polymer is easy, but equally so is molding. Transparent facades as the one at the Liquid Wall in Berlin, the flagship store of Raab Karcher, would be a nightmare in glass, but are feasible in acrylic. Home Couture Berlin is a showroom for tiles and spa accessories. The store provides an ideal presentation platform for Raab Karcher and its joint-venture partners from the premium tile and bathroom fittings sector. The store functions as an elongated shop window for passers-by. The ‘liquid wall’ installation of milled Plexiglas appears as a vertical wall of water and serves as an eye-catcher in the Ku’Damm facade. The distorting lens makes the illuminated back wall oscillate as you wander past it. The shop window has been made after a 50mm Plexiglas sheet milled, formed and polished to get convex and concave surfaces. This form creates an effect of a moving room while walking by the window, as if the inside were a swimming pool. If you need more inspiration, have a look at these four polymer materials suppliers: 3form, Panelite, Lightblocks and Krystaclear. These are all US-based companies at the verge of another revolution: they are not just suppliers, but also fabricators, engineers, materials researchers and high-end designers. They are in the front of the ‘design to manufacture’ concept that is changing the way materials are used. And they are all based in polymers. When you can’t win your enemies, join them. 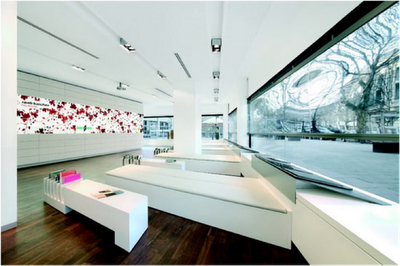 Another interesting product is Gewe-composite by the German glass supplier Schollglas. This laminated safety glass made with two sheets of glass and an intermediate 2mm polymeric membrane, can replace thicker glass-PVB laminates, is very easy to cold bend and does not stop UV radiation, thus making it very appropriate for winter gardens. The Amazonienhaus botanical greenhouse in Stuttgart is a good example of high UV-transmission, low-e coating composite transparent cladding. Another striking use of this composite in a bent application – non heat mold required – is the Mobile Formula 1 Event Centre for McLaren in the UK. The cold bent composite here integrates metal sheets and comes with a highly selective coating. There are still issues to solve and improve with thermoplastics before they can replace glass in curtain walls. Even if their mechanical properties are OK in general (impact resistance being great in particular) long term creep deformation is a clear disadvantage. The elastic modulus of extruded polycarbonate, for example, can be reduced to 40% after 1000 hours of constant loading. Regarding durability, polymers and acrylics offer a lower durability and weatherability under outside exposure compared to glass. Coated protections against UV have improved this, but there is still a way to go. The yelowness index (YI) measures discoloration levels under UV exposure, and values above YI-8 are not recommended for external use. Another issue that must be integrated in the design is the thermal movement of plastics. The coefficient of thermal expansion of both polycarbonate and PMMA is 6 to 7 times greater than that of glass. Beware of the expansion pockets and frame movements! Abrasion resistance of plastics has improved with external coatings, but its value is still 2 to 4 times lower than that of glass. The biggest issue with plastics as external facade elements is probably their flammability or fire reaction. On one side, PC, PMMA and glass all conform to the flammability requirements of the ASTM codes. However, full compliance with the International Building Code (IBC) has to be checked case by case. The IBC limits the installation of plastic glazing to a maximum area of 50% of a building facade. It is interesting to note that the U-value of a single layer of 6mm of transparent glass, polycarbonate or acrylic is practically the same: between 5,2 and 5,8W/m2ºK (glass being the highest). We get a similar result with g-value and light transmittance: uncoated glass and polycarbonate transmit the same amount of solar and visible radiation, while acrylic is slightly more transparent in both cases. But when we introduce selective coatings, glass performs much better than plastics in energy and visible light terms. Up to now, though. In response to recent inquiries regarding condensation issues with Polycarbonate installations, Gallina USA has compiled the following information in a convenient PDF document available for immediate download. This information is also available in our Frequently Asked Questions section. Should any additional questions or concerns remain, please contact your Gallina Representative. Gallina USA is excited to announce the release of our new 2013 architectural brochure! Please click the following link to download your copy of the brochure in the PDF format. Gallina USA 2013 Architectural Brochure. Since opening on June 9th, 2011 in Kansas City, Kansas, the Livestrong Sporting Park has been awarded Best Venue for 2012. Duo-Gard Industries Inc. was the company in charge of developing the project for the largest polycarbonate canopy ever produced and installed in the United States. Gallina USA was very proud to have supported our partner in Bogota, Colombia with a joint presentation to debut arcoPlus® to the architectural community in that region. The professionalism and organization provided by Rodrigo Diaz-Munoz, the commercial sales manager with Mathiesen/Colombia, was outstanding and allowed all who attended to learn, share design ideas and discuss growth for arcoPlus® in the Colombian market. All of us at Gallina USA appreciate his hard work and effort and look forward to a strong partnership. Lamborghini new factory: first example of Italian industrial building certified in Class A. On 5th July the new Lamborghini industrial building was inaugurated at the presence of Italian Ministry of Environment and Territory, Mr. Corrado Clini. The new multi-level building stands in Class A according to the directive 2010/31/EU of the European Parliment and of the European Council. In the heart of the land recently struck by an heavy-impact earthquake, one of the most important Italian industries, well-known worldwide for its fast and fashionable cars, links itself with efficiency and sustainability realizing an high-performance building able to grant an yearly energy consumption of less than 8 kWh/m2. Gallina USA is very proud to debut our new extrusion capabilities at our Janesville, WI manufacturing facility. Gallina will be producing our ArcoPlus® standing seam and 40mm tongue and groove polycarbonate panel systems for distribution in North and South America. 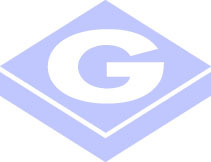 Gallina USA is the only polycarbonate extruder in the United States manufacturing multiwall flat sheet and panels. We welcome architects and designers to speak with us directly and learn how introducing these panels into your designs can improve daylighting, reduce utility costs and improve thermal values compared with other glazing materials. Recently opened in Sicily is the region’s largest mall “Centro Sicilia”. This single level structure is an excellent example of functional architectural that incorporates the principals of “green and sustainable” design.